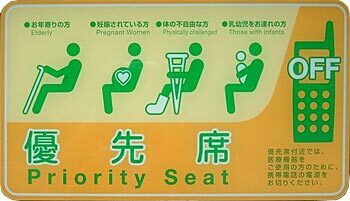 In the 1970s Japanese public transportation companies introduced a system to special seats which should be used by handicapped people on priority basis. Since the 1980s they usually used to be called as "silver seats", because silver color was introduced by the Japanese National Railways for those special seats and only old people should be given special treatment. At the end of the 1990s the scope of the privileged people was enlarged to include pregnant women, physically challenged and those with infants and those seats became gradually called "priority seats". The people with artificial pacemaker are also paid special attention and it is requested to switch off mobile phones around priority seats, because they might adversely affect the functioning of pacemakers. A sticker appealing to passengers to pay attention to handicapped people. 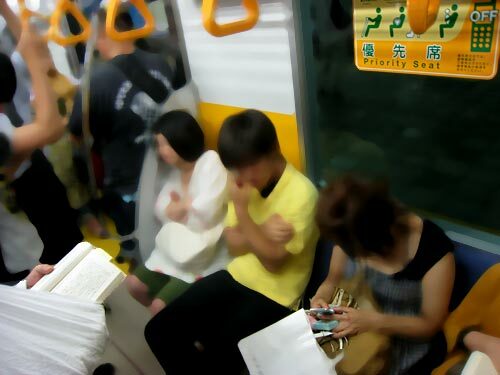 A scene near priority seats in an evening in a train of Inokashira-Line. Whey do they desperately want to sit down? The society with so many worn out young people does not have a promising future, I am convinced. Of course some elderly people deny the offer to give up a seat, as they are proud enough not to be treated as weak old people who should be protected by younger people. Therefore, it is not easy to take a chance to surrender a seat to an old person. Some people might feel uncomfortable and worry what to do, when old people are tottering and nearing them. However, today's young people seem to feel themselves exhausted and handicapped - or maybe disabled. They rush into vacant seats, regardless whether they are priority seats, and immediately pick up their mobile phones or pretend to sleep deeply. This photo is an example of priority seats in the evening. An orange colored sticker on the window draws people's attention to priority seats and invites people to give up seats to handicapped people and to switch of mobile phones. Incidentally an older man - seemingly mid 60s - came and stood before the priority seats and started reading. He had his right arm in a plaster cast. Nobody paid attention to him, maybe because he did not have his leg in a plaster as is shown as an example of physically challenged people on the sticker. A girl continued to use their mobile phones - later she was joined by her neighboring boy - presumably because she noticed that nobody in her vicinity used artificial pacemakers. Young people are very practical and flexible according to individual situations, aren't they?